In continuing pursuit of a policy whose effects, if not means, are indistinguishable from the ethnic cleansing and genocide visited on Native peoples throughout American history, the United States seeks to relocate Navajo (Dineh) people living on that portion of traditional Navajo lands recently designated by the government to be for the exclusive use and occupancy of the Hopi. This policy is the solution to a nonexistent but cleverly manufactured “range war” between the Hopi and Navajo, who have, in fact, coexisted peaceably for many generations. Dineh (Navajo) families are currently struggling against corporate and governmental powers which have attacked their right to remain on their ancestral land, to practice their traditional life-style and religion, and to retain their civil rights. 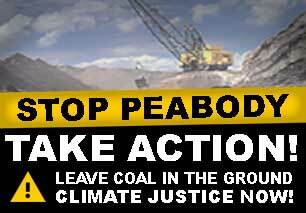 The primary corporate power is Peabody Coal Company, which operates two large strip mines in the area and whose activities have caused environmental damage and the destruction of burial and sacred sites. The governmental powers include the Hopi and Navajo tribal governments, whose history and operation are interlinked with the mining industry, and the US Government, which empowered the tribal governments at the expense of the people on the land. The combined actions of these corporate and governmental powers have had a devastating impact on the Dineh families. The forcible relocation of Dineh families living in areas partitioned to the Hopi Tribal government was mandated by P.L. 93-531 in 1974. Over 12,000 people have already been relocated from their ancestral land at a cost of over $350 million to the US government, land to which they are intimately bound by their religion and traditional economy. The estimated 250 Dineh families who remain on the land are currently being forced to choose between relocation and life without civil rights under the rule of an openly hostile government. Families near the mining area are subject to the routine destruction of their burial and sacred sites by mining activities which have also destroyed water supplies, defaced the landscape, and negatively impacted their health. In its war against the Dineh who have resisted relocation, the US Government has destroyed wells that supplied water needed for their survival in the arid climate, outlawed even the most basic home repairs, confiscated the livestock that sustain their subsistence life-style, and subjected them to the rule of a tribal government in which they are not allowed to vote or participate. The driving force behind the oppression was the discovery of enormous reserves of low-sulfur coal beneath the surface of their ancestral lands, so that control of these lands became the subject of a dispute between tribal governments manipulated by the coal companies. In the resolution to this dispute arranged by the US government, the civil rights of the Dineh were sacrificed so as to satisfy the ambitions of the coal companies and the tribal governments. Events leading to removal of the Dineh can be traced back to the “Long Walk,” or forced relocation by Kit Carson and the U.S. Army of 10,000 Navajo from their ancestral homeland to an internment camp about 400 miles to the east. The belief that gold was abundant in Navajo territory enabled settlers, with the aid of the U.S. military, to easily overcome any concerns they may have had about the Navajo´s explicit rights to live unmolested in their ancient territory. The 7,000 survivors of the march were concentrated at Ft. Sumner, where many more died in the barbaric conditions of their internment. Hitler later studied this internment as a model for the creation of concentration camps. In subsequent decades, the U.S. pushed the Navajo westward by forcing them to cede eastern portions of their treaty lands. Eventually, the Navajo surrounded the much smaller Hopi Nation. In 1934, Congress passed the Indian Reorganization Act. Under the guise of support for the ideal of self-determination, tribes were encouraged and pressured to establish electoral, “representative” governments that mining companies and the BIA could more easily control than they could traditional leadership. In 1936, an election boycotted by the majority of Hopi opposed to nontraditional governance, established a government recognized by the U.S. In the 1950s, lawyers seeking self-enrichment at the expense of the tribes, insinuated themselves, with BIA approval, as counsel for tribal governments formed through their efforts. John Boyden, a Salt Lake City lawyer, was retained as Hopi counsel. Boyden, a Mormon Deacon, also represented the Peabody Coal Company and was counsel for the Mormon Church, which owned a controlling interest in Peabody Coal. (Thus, Peabody eventually gained subsurface rights on exclusive Hopi territory for a fraction of fees paid elsewhere, and continues to lease mineral rights in Navajo/Hopi territory to this day.) Attorney Norman Littell was hired by the Navajo Tribal Council. His contract provided him with 10 percent of coal revenues. Both lawyers were also motivated by statutory fees of 10 percent in Indian Claims Commission (I.C.C.) cases, seeking damages for wrongful taking of native lands. Only after accepting settlements were the tribes informed of the real purpose of the I.C.C. : to settle land claims by paying a pittance and thereby foreclose actions to recover lands wrongfully taken. Unsettled boundary issues between the Hopi and Navajo remained an obstacle to mineral leasing interests. The coal deposits were mostly located on the area of the 1882 Reservation outside District 6. Boyden’s Hopi government claimed rights to the deposits within the 1882 Reservation it controlled. Littell’s Navajo government claimed the rights because the area was inhabited by Dineh. The lawyers filed a collusive lawsuit against each other in 1958, each tribe claiming the entire 1882 reservation. The 1962 Healing v Jones decision designated District 6 as exclusive Hopi land, and the rest of the 1882 reservation as a Joint Use Area. The mineral rights to the Joint Use Area would be divided between the two governments, and leases with Peabody Coal were signed in 1966. A lawsuit against the leasing was brought by traditional Hopi whose religion forbade strip mining. The suit was dismissed for failure to join an indispensable party (the Hopi tribe) that could not be joined due to sovereign immunity. By its ruling, the Court simply avoided the claim that the recognized government was fraudulently imposed. Exploitation of Joint Use land continued to be problematic, given dual tribal interests, but the lawyers had a solution. Coinciding with the pressures of the 1970s energy crisis, the attorneys and mining interests planted stories about a budding “range war” between Hopi and Navajo (there is even evidence that Boyden retained a public relations firm to promote the story) and lobbied hard for federal legislation that was required to separate Hopi and Navajo interests. In 1974, with little opportunity for input from tribal people, Congress passed the Navajo-Hopi Settlement Act, dividing the Joint Use Area into Navajo Partition Land (NPL), on which lived 100 Hopi, and Hopi Partition Land (HPL), on which lived 13,000 Navajo. Those on the wrong side of the line were required to relocate. Over the course of the next decade, thousands of Navajo were evicted from their homes and sacred lands. In 1988, Manybeads v. U.S. was filed to stop the relocations. The suit challenged the Navajo relocation primarily by alleging that it destroys the Navajo´s right to exercise site-specific religion. The 9th Circuit detoured the case into mediation, which was wrestled from the grasp of the plaintiffs into that of the tribal governments. They negotiated an Accommodation Agreement, permitting only specified individuals to sign, and thereby to stay put for 75 years but thereafter to forego relocation benefits. Other Dineh who were ineligible to sign were simply required to move on. This “Accommodation Agreement” was passed into law by the Congress in 1996. Recently, the “Manybeads v. U.S. case was recently dismissed. Again, the rationale was for failure to join an indispensable party (the Hopi Tribe). Congress had not considered how it was going to evict all the people in an area larger than the state of Rhode Island. A partial solution turned up in 1979 when a dam at a uranium mine burst and contaminated a huge area in two states with the nation’s largest radiation spill. The US bought the land at a discount and turned it into the “New Lands” for the relocated Dineh. 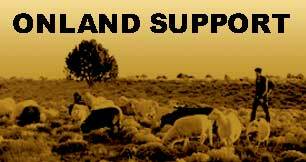 Purchased at a bargain basement price by the U.S. in 1980, the New Lands, near Sanders, Arizona, are completely inadequate for subsistence grazing and agriculture, and are 60 miles downstream from the containment dam that held back uranium-contaminated water until the dam burst and the water spilled into the Rio Puerco. Through the federally established Office of Navajo and Hopi Indian Relocation (ONHIR), a total bounty of $25 million to the Hopi was placed on Navajo Accommodation Agreement signatures, resulting in fraud, threats, and intimidation. The nonsigning resisters who cooperate with the ONHIR in their removal have some say in the location and construction of replacement housing. Resisters who do not cooperate will be concentrated in the “New Lands.” Removal of both cooperating and noncooperating resisters began in February 2000. Meanwhile, the ONHIR enforces a strict prohibition against repairs and improvements to the properties of resisters. New glass for a broken window must be smuggled in. Vehicles and homes are searched for building materials, which when found, are confiscated. Both signators and nonsignators alike are subject to grazing restrictions that require them to sell most of their sheep and cattle, leaving them with insufficient numbers to maintain a subsistence living. Those who refuse to sell or corral their animals endure confiscation without compensation. In 1998, the United Nations (UN) High Commissioner for Human Rights sent an investigator to the area. It was the first time a UN human rights organ officially and publicly took on investigation of a specific case against the U.S., being particularly concerned about the impact of the relocation on the practice of traditional Dineh religion. The Dineh religion is closely bound to their traditional land, and relocation would destroy their traditional religion. The UN report, The Lehigh Presbytery of the Synod of the Trinity, The General Board of Church and Society of The United Methodist Church, the World Council of Churches and the Society for Threatened Peoples agree with the position of the UN Special Rapporteur on Religious Intolerance, Mr. Abdelfattah Amor, and over 250 Non-Government Organizations at the UN, that the human and religious rights of the Traditional Dineh people are being violated. During the plenary sessions in Strassbourg on February 17, 2000, the EUROPEAN PARLIAMENT adopted the URGENCY RESOLUTION, against the forced relocation, the ongoing violations of human, religious and land rights of the Dineh at ‘Big Mountain’ and raised the concerns of the European Parliament members about the contaminated ‘New Lands’. In this Resolution, they call upon the US Government to respect the land rights of the Dineh people as well as the provisions for Indigenous peoples of the Vienna Declaration. The US policy is edging toward its Final Solution. In about 30 days, the first 12 non-signer families who did not sign the leases will receive notices by the US government for eviction trials in US court. At the same time, Dineh on HPL have received general notices from the BIA informing them that their livestock, on which they depend for survival, will be impounded. Several impoundments have taken place, most of them conducted in violation of federal law. The only alternative the Dineh people are given is to sign up for Relocation or face eviction without any benefits. The relocation program has been a tragic failure. In mandating relocation, the US government overlooked alternative methods for resolving the conflict between the tribal governments, such as financial compensation as normally used in such cases. It further ignored the impact of relocation upon people whose religion was intimately bound to their ancestral homesites. We urge all Americans to call upon Congress to repeal legislation that legalizes ethnic cleansing, that arbitrarily confiscates the homes and property of the poorest people in the country, and that strips people of their civil rights solely because of their ethnic origin. Please contact your representatives and remind them that the foundation of all policy toward America’s native peoples should be respect for their right to remain on their ancestral land, to practice their traditional religion, and to enjoy the same protections and civil rights offered to all other citizens.